Gold (Au) trades 24 hours a day on markets throughout the world using the code “XAU”. The London bullion market (LBMA) is regarded as the industry benchmark, with the spot price set twice daily at 10:30am and 3:00pm GMT in US dollars. Continuous trading occurs in over-the-counter (OTC) gold markets and via futures contracts (e.g. LME and CME Group). Net purchases of gold by central banks can affect the price. When the USD is strong, people are more optimistic and prefer to trade in USDs, pushing the price of gold down. Gold is seen as a “safe haven” to store wealth during volatile and uncertain times. Around half of all gold demand is driven by jewellery with China, India and the US being primary buyers. Australia holds around 17% of the world's gold resources and accounts for 9% of global production. Western Australia alone produces almost 68% of Australia's gold. 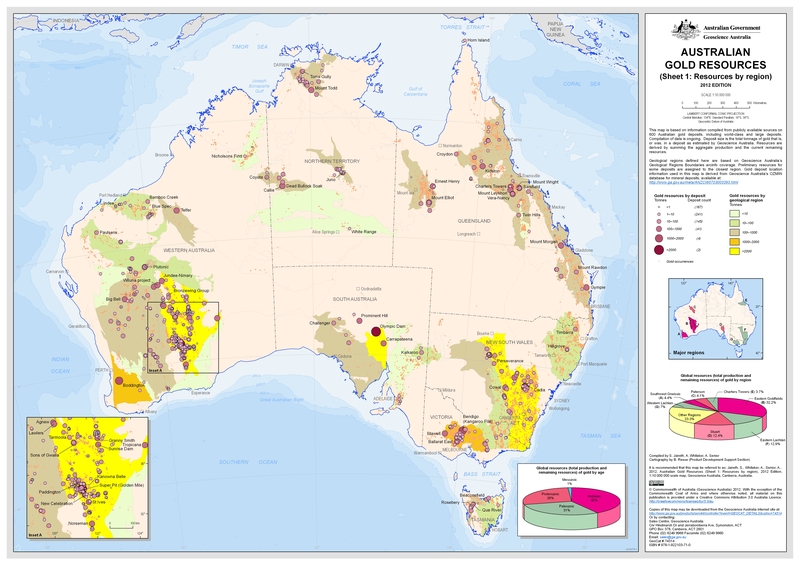 View an image of Australia’s 2016 gold deposits and operating mines. What is the gold "spot price"? The gold “spot price” is the current market price in US dollars for a troy ounce (31.1g) of 99.99% pure gold. Sometimes a website will display the spot price in a local currency (e.g. AUD on an Australian website) by converting the USD price to the local currency. When a website converts the price to a local currency, it’s usually indicated. What's the difference between "ounce" and "troy ounce"? Gold is measured in troy ounces where one troy ounce equals 31.1035g (as compared to a regular ounce being 28.3495g). Gold bars range in size from 0.032oz (1g) to 50oz (1.6kg). Why does the gold price differ between websites? There is no "official" 24 hour gold price. While the LBMA is considered the industry benchmark, its price is only set twice daily. To publish 24 hour prices, data must be compiled from different exchanges or futures markets. Data feeds may use the bid price, ask price, the average, or combine different data feeds. The closing price or day's movement may differ according to the site's timezone e.g. Europe, North America or Asia. Either way, the difference in price between websites is usually negligible. Gold is traded throughout the world in multiple timezones so there’s always at least one market open (excluding weekends). Is gold cheaper in different countries? No, gold markets move in unison. If there was a difference in price then arbitrage opportunities would exist. Which country holds the most gold? How can Australians invest in gold? The Perth Mint is Australia’s official bullion dealer. Buy gold coins, bars and nuggets with purity guaranteed by the Government of Western Australia. Bars can usually be traded internationally without the need for assay. Bullion is normally traded at a slight premium to the spot price to cover manufacturing costs. 1. ANZ Physical Gold (ZGOL) - Backed by physical gold held in the ANZ’s Singapore vault. 2. BetaShares Gold Bullion Currency Hedged (QAU) - Backed by gold bullion with a currency hedge. 3. ETFs Physical Gold (GOLD) - Backed by gold held by HSBC Bank plc. 4. Perth Mint Gold (PMGOLD) - A fully paid call option to one hundredth of a troy ounce of physical gold. For more information on these ETFs please visit the ASX ETFs page. See the list of ASX gold companies above. Download a spreadsheet of the official gold price (USD & AUD) since 1968. Official data from the World Gold Council showing each countries gold holdings in tonnes. The 2017 and 2016 report are also available. A huge 9MB image with all Australia's gold deposits. ASX-listed Gold ETFs - A list of ETFs that provide exposure to the gold price.